Florence Chadwick, Dover Beach. Florence Chadwick, the cross-channel swimmer. Florence Chadwick was the twelfth woman to swim the channel and beat Gertrude Ederles record (Ederle was the first woman to successfully make the crossing), completing the crossing in 13 hours and 23 minutes, in August 1950. 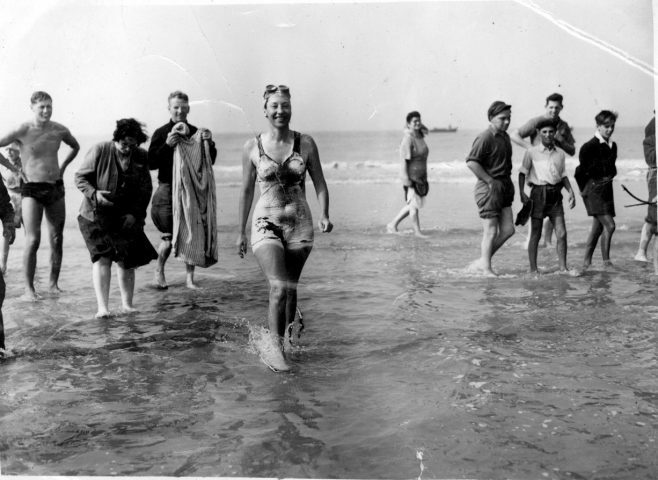 She completed the return trip (from England to France) in September 1951 in 16 hours 22 minutes, becoming the first woman to swim both ways. She swam England-to-France in 1953, her time was 14hrs 42mins. She also held the England to France womens speed record with her crossing in October 1955 of 13 hours, 55 minutes. She was the first person to swim England to France three times. Florence made five unsuccessful attempts; France to England 1950 July 26th, time 8hrs. England to France 1953 August 2nd, 9hrs 55mins. England to France 1955 August 15th, 7hrs 00mins. England to France 1955 Sept. 23rd, 12hrs. England to France 1955 Sept 26th, 5hrs. She was the first lady to swim the Catalina Channel. The swim was a new record for both men & women, in a time of 13 hrs 42 mins. She also swam the Bospourous, the Dardenelles and the Straits of Gibraltar, all in World Record times.